James Norris – an insane American. The sad tale of James Norris (mistakenly called William by the press) captured the attention of the public in 1814 when he was discovered in Bethlem Royal Hospital, mechanically restrained and in poor health, having been confined in isolation for more than ten years. Norris, a seaman from America, was originally incarcerated in ‘Bedlam’ for an unnamed lunacy and was, after a number of violent incidents, restrained in this extraordinary device designed specifically for him. No less than six members of parliament visited Norris during 1814, each maintaining that he was rational, quiet, and capable of coherent and topical conversation. 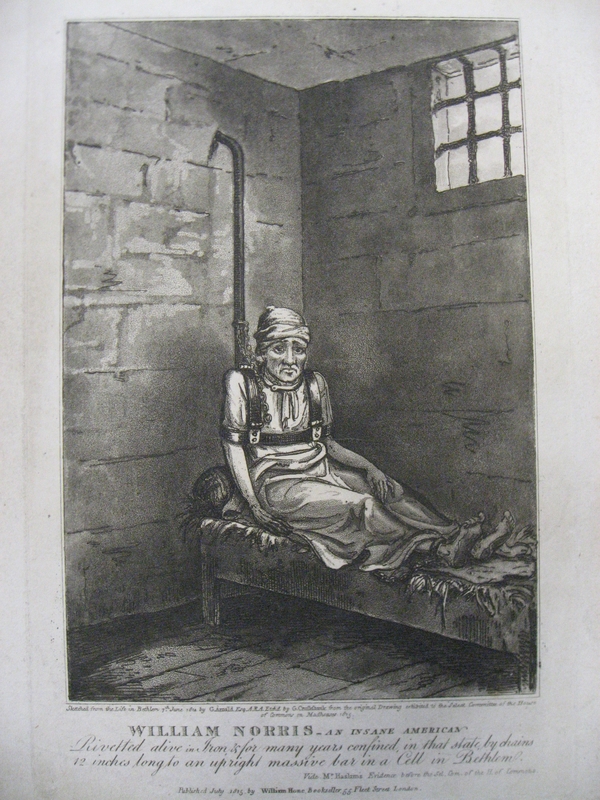 As a result of the publication of this image and the interest it generated in asylum reform, Norris was released from his restraints in 1814, yet remained confined in Bethlem. However, the conditions he had endured for more than ten years had so weakened his constitution that he died within a few weeks of his release, of either pneumonia or tuberculosis. The case of James Norris, and the public interest it created, was instrumental in the creation of the Mad House Act of 1828, which sought to license and regulate asylums for the insane, and to improve the treatment of the insane. This entry was posted on Thursday, September 18th, 2008 at 8:24 am and is filed under Nineteenth-Century Entertainment. You can follow any responses to this entry through the RSS 2.0 feed. You can leave a response, or trackback from your own site. One Response to James Norris – an insane American.